The 3 Gallon Oval Wastebasket features a sleek modern aesthetic and polished rim that adds a fashionable element and complements the décor of any room in your home. The textured exterior provides easy cleaning. Its slim oval profile is ideal for use in the office, bathroom and craft room or where ever space is limited. 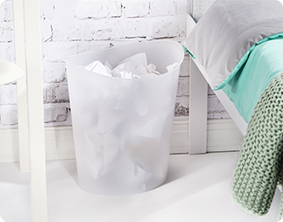 This discrete wastebasket fits neatly under a desk or table to conceal any trash or debris. Its slim profile also fits perfectly between furniture in small bedrooms or in dorm rooms. This wastebasket accommodates a standard plastic shopping bag. The overall dimensions for this item are 11 3/4" L x 9 1/2" W x 12 5/8" H.
Overall Assembled Size: 11 3/4" x 9 1/2" x 12 5/8"
Slim profile fits perfectly between furniture in small bedrooms or dorm rooms. 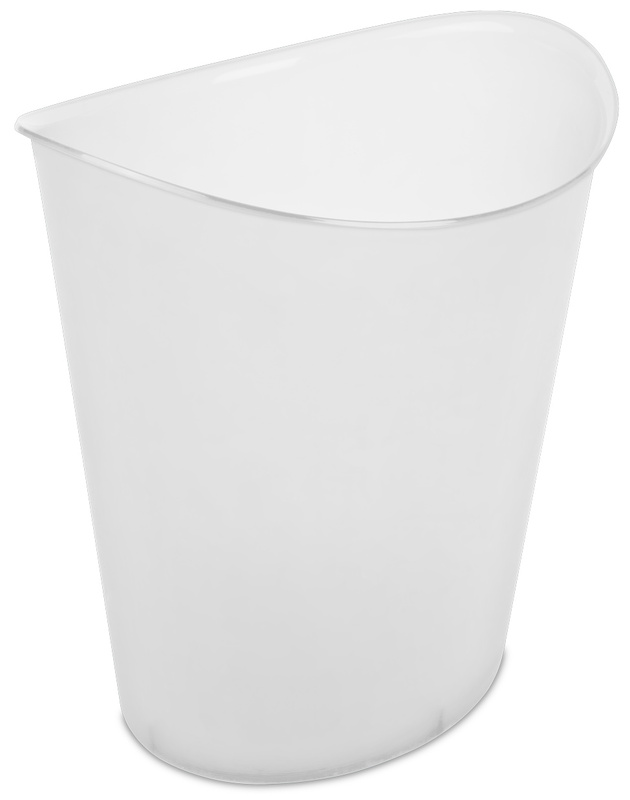 3 Gallon Oval Wastebasket is rated 4.8 out of 5 by 4. Rated 5 out of 5 by bluebird75 from Love the contour shape of this can! This wastebasket has lasted us for eons!! While it has a ding on one side, after years of use, it is still useful for trash in our basement and garage. I love the light blue color, the trendy style of the top and the overall look! It matches our decor and holds a lot of garbage!! Rated 5 out of 5 by vetchick from Nice wastebasket This is a nice looking wastebasket. It's durable and has nice curves. It's the perfect size for my bedroom where I don't have a lot of space. 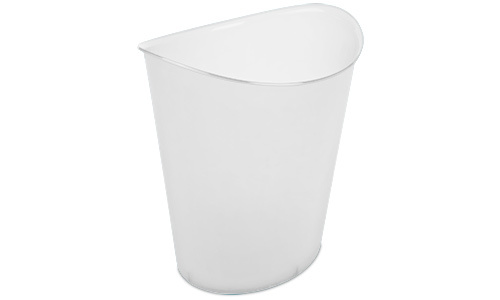 Rated 5 out of 5 by Corina from Pleasantly surprised by its capabilities When I received this wastebasket for in-home testing, I was hesitant to put it where it was most-needed: the only bathroom. After one week of use, it has proved to be more durable than the one-gallon, step-lid it replaced. It will not rust. It is narrow enough to fit next to my bathroom sink, and holds seven day's worth of refuse for five people until garbage day. My favorite feature, though, is the fact that standard-size, plastic bags from my most-visited retailers fit completely and stay over the lip of the basket until garbage day. No assistance is needed. Yay. Rated 4 out of 5 by tadols from Overall I like this wastebasket This wastebasket is a good size at 3 gal. capacity. It is larger than most of my wastebaskets. I also like the shape of the basket, which with an oval top lip was easier to lift and empty. My only concern is that if you dispose of anything dirty in the wastebasket that it may leave a stain in this clear wastebasket and my be hard to clean. I received this basket free from Sterilite as a review panel member but this did not affect my review of the product.